The realities explored in science and spirituality are often assumed to be unrelated to one another however in the ancient world these two forms of knowledge were not in conflict but were understood to have a deep and subtle connection. Man’s knowledge of himself complemented his understanding of the universe and formed the basis for a strong relationship to the enviroment in which he lived. 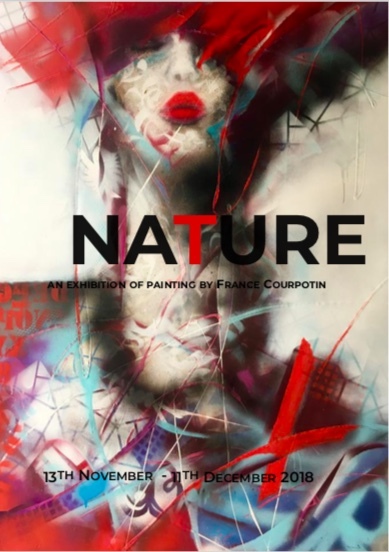 In this exhibition the France Courpotin examines our deep connection with NATURE and its wonderful, deep yet fragile balance. France Courpotin's pictorial work combines graphic design and colours in a highly personal way. She is a natural colourist and in order to explore all textures, she uses many materials such as ink, acrylic, oil, aerosol, pigment and resin.